Hope everyone is doing good. I am doing well, trying to keep cool in 110 degree heat today. Thank God for AC! 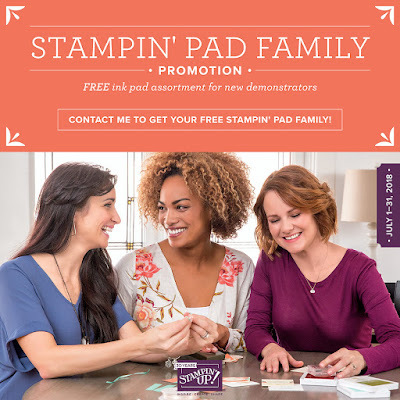 I wanted to talk today in regards to signing up with Stampin Up. Please feel free to pass this along to anyone whom you think would be interested. - Right off the bat you get free stuff. 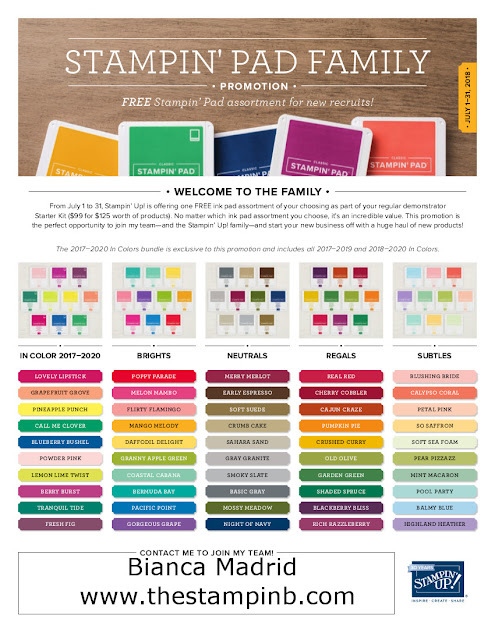 Until July 31st if you sign up you get $125 worth of Stampin Up product that you choose for only $99, plus a set of your choosing of any color family ink pads- You choose either Neutrals, Brights, Regals, Subtles, or In-Colors and you will receive all 10 ink pads for FREE. All you are paying is $99 and you get over $200 worth of products plus FREE SHIPPING!! -Also you receive 20% off any purchase you make. Now I have record of everyone's total amounts that they have spent with me over the past 5 years. If I told you them you would freak out but if I was to show you them with a 20% discount you'd feel much better about it. Don't get me wrong, I love when you guys purchase from me. You help support my creativity and my family and I appreciate all of you. Even if you were to sign up as a hobby demo you'd still be helping me out. -One of the best perks of being a demonstrator is getting to see and purchase products before customers get to. Coming up in August is our new Holiday Catalog. Starting on August 1-31st you can purchase from the catalog, play with all the new product and prepare your Christmas cards way in advance before everyone else. Believe me when I saw the benefit of completing your Christmas cards before Christmas is amazing. You'd actually have time to enjoy the holiday instead of stressing with it. These are just some of the perks of being a Stampin Up Demonstrator. I want to stress that you don't need to do this and make a full time business out of it. Being a hobby demonstrator is perfectly fine and so worth it. The discount alone is the best offer. It makes you a smart shopper to sign up. Any questions I'm always available to help.